Free English lesson plan. The 80 page level 12 TEFL course uses the English only communicative approach to teach English as a foreign language. 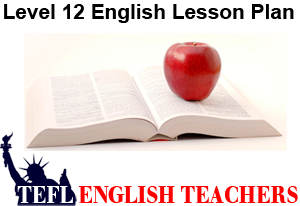 The level 12 English only lesson plan is designed to teach a 4 week – 20 day course. The curriculum for the first 3 weeks of classroom instruction offers 12 daily homework assignments and 3 weekly written exams administered to students on a Friday. Week 4 is comprised of oral & reading exams followed by graduation on day 20. The TEFL English lesson plan documents every segment of the bell curve from the Day 1 Greeting through the Day 20 Graduation Ceremony. The bell curve format makes class room instruction easy to use and follow.